The head of the College Valley is a wild and lonely place. The broad, green slopes of West Hill, on the shoulder of the mighty Cheviot, climb steeply to the east, whilst to the west the Schil dominates the skyline. The ice sculpted cleft of the Hen Hole separates West Hill from Auchope Cairn and draws the enquiring eye into its buttress flanked depths. The border between England and Scotland lies to the south, crossing the saddle between Auchope Cairn and the aptly named Red Cribs. This walk, which starts in the neighbouring Harthope Valley and passes through the secluded Lambden Valley, takes you on an out of the ordinary journey, offering extensive views into Scotland and to the Northumberland North Sea coast. It crosses the highest hill in the county as it follows an exhilarating and lung expanding route. 1. 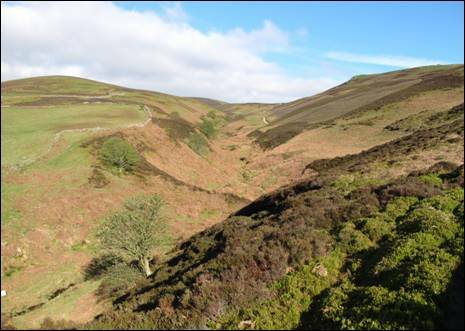 Described by William Weaver Tomlinson in his 1888 book, `Comprehensive Guide to Northumberland` as, “A moorland glen - one of the most charming on the Borders - through which runs a splashing streamlet, fringed with patches of gorse and belts of natural wood”, the Harthope Valley lies south west of the north Northumberland town of Wooler. The `highlight` of the delightful 5 mile drive into the valley is the descent of the steep hill commonly referred to as Skirl Naked after the cottage which stands at the top of the hill. This cottage was once called a slightly more romantic Shining Pool. The road, in fact, cuts across the hillside known as Armour Bank, referred to by W. W. Tomlinson, and shown on earlier maps, as `Armer Brae`. There is adequate roadside parking where the Hawsen Burn meets with the Harthope Burn (NT 953225). Alongside the Hawsen Burn is a circular stone sheep stell, a common sight in the Cheviot Hills, and this marks the beginning of the walk. This was also the starting point of the 6.2 mile, out and back, 2007 inaugurated Cheviot Summit Fell Race which, sadly, was last run in 2012. Your walk to the monolithic triangulation pillar takes a rather more circuitous route. 2. With your back to the stell and the Hawsen Burn to your left, climb straight up the facing slope to pick up a clear path, heading in a north westerly direction up the narrow valley. You will stay with this valley for its full length. Soon you will join a rough stone track and after a further 200 metres you will reach a directional fingerpost on your left. Do not leave the main track as your route still continues uphill on the rough gravel track until you see a side track leading off to your left. As you climb, take time for a backwards glance at Housey Crags, standing high above the fast disappearing Harthope Valley. Take this subsidiary track as it cuts across the slope of the hill and soon you will merge with a path coming in from your left. Keep heading upwards, eventually cutting through heather, until a post and wire fence is reached (NT 935229). You are now standing at the head of the remote Lambden Valley but before entering the valley you will need to turn right for some 200 metres as far as the step stile. Cross over the step stile and continue straight ahead. To your left, the bulk of The Cheviot looms over you like a moody giant as you head downhill towards an old forestry track. On reaching this track, turn right in the direction of a small plantation and, in turn, cross over the remains of a step stile next to a five bar gate. Follow the yellow public footpath arrows into the plantation and continue on a thin path through the trees. On reaching daylight once again, head diagonally down the lower slopes of Preston Hill. Keeping on a westwards course and following the yellow arrows first ford the Lambden Burn and then on reaching the opposite bank climb over the step stile next to the trees alongside the burn. Soon you will come to the Goldscleugh Burn, cross over carefully, turn left and, after going through two five bar gates, pass behind the farm buildings (NT 913233) and head across the field towards the gate and the public footpath signpost. 3. The farmstead of Goldscleugh is one of only three properties in the valley and the only one which is still occupied as a permanent dwelling. The remaining two, Dunsdale and Coldburn, have been extensively refurbished and are now used as holiday lets. Once through the gate turn left and enjoy a pleasant 1 mile stroll along the tarmac valley road with the Lambden Burn wandering below you on your right. The steep sides of Coldburn Hill climb away to the north. The whitewashed buildings of Dunsdale stand at the base of an interesting cleft in the north face of the Cheviot known as the Bizzle. With its exposed mass of granite, this area has witnessed over the years several winter fatalities. In 1988 two climbers were killed by a snow avalanche on Bizzle Crags. Turn left towards the cottage and, following the public footpath, pass behind the buildings and then continue a short distance uphill on a stone track towards the forest edge, a large part of which has been recently harvested. Now you must make sure that you pick up the faint quad track (NT 896231) to your left and just beyond the fence which heads uphill. The track climbs in a generally southerly direction keeping to the west of Bizzle Crags. The really hard work now gets underway as you commence an unremitting climb, covering a fraction over 1 mile in distance, aiming for the unmistakable rocky outcrop of Braydon Crag. But this is not yet in view. Be sure, as you go, to take time to turn your head and enjoy the outstanding views, especially to Newton Tors, Coldburn Hill and Dunsdale Crag. You will be thankful for a `breather` or two! When, after a while, the ground levels off head diagonally to your right targeting the five bar gate in the facing post and wire fence. Go through the gate and, aiming just to the left of the small crags ahead, you should be able to pick up a very faint track up the steep hillside. When the track fades, turn towards the crags and once there continue straight uphill passing a number of small rocky outcrops. The visible Braydon Crag now lies straight ahead. 3. 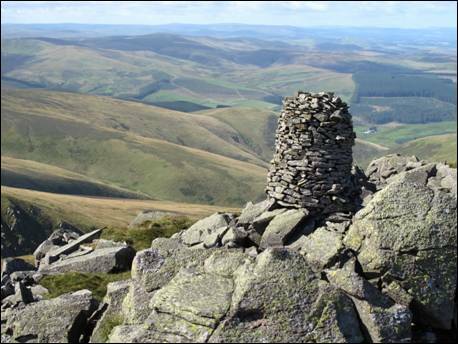 The impressive Braydon Crag (NT 893214) is part of a circle of hardened rocks, known as a metamorphic aureole, which surrounds the 815 metre high Cheviot. Other examples of this aureole can be seen, west of the summit, in the Hen Hole and on the Schil. The crag is perhaps best known as the place where a bomb laden U.S. Army Air Force B17 Flying Fortress crashed during a late afternoon blizzard in December 1944. Before the bombs exploded, two local shepherds from Dunsdale and Southernknowe, guided by sheepdog Sheila, found four of the crew alive sheltering in a peat hole, whilst a further three found their own way off the hill to Mounthooly. Sadly, the remaining two members of the crew died in the crash. The ashes of the pilot, George Kyle, who survived the crash, were scattered across this area on the 4th October 2006 in accordance with his final wishes. The crash site lies to the south of the crag, approximately 200 metres beyond the peat line. 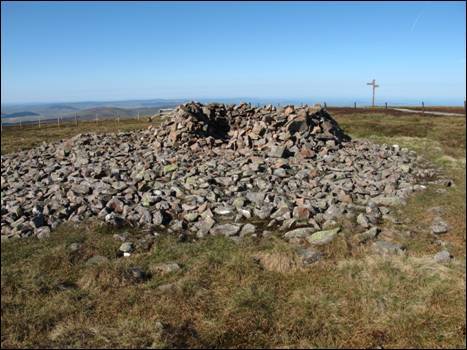 From Braydon Crag, a faint, intermittent track contours the hill in a generally southerly direction, just below the prominent peat hags, as far as the next unnamed, cairn topped outcrop of rock, three-quarters of a mile away. On reaching the first and lower of the two crags you will need to turn slightly to your left and walk the short distance to the second and substantially larger crag (NT 889206). Here there are two extremely impressive stone men. 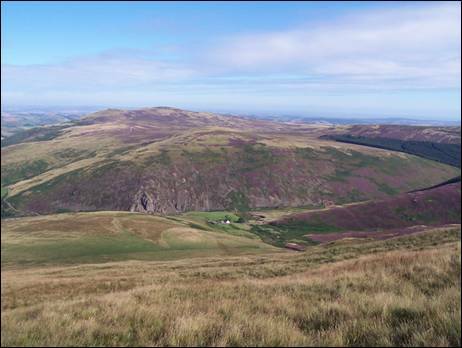 The views from this tremendous spot are outstanding, as you stand, at a height of 709 metres, looking across the Hen Hole to Auchope Cairn and down to the head of the picturesque College Valley. 4. Leave the crag by a faint path, first heading north easterly and then turning south, contouring above the corrie of the Hen Hole around the 700 metre contour. This is perhaps the finest stretch of walking in the Cheviot Hills with the views into the Hen Hole and beyond quite breathtaking. In her 1923 book, `Northumberland`, writer Agnes Herbert wrote that she had been told that, “if you were near the weird chasm of the Hen Hole at just the right moment, on just the right day, you will hear the horn of the hunter who was lured into the sombre glen by a mountain fairy”. So, as you continue forwards, keep your ears well and truly tuned; today might just be that day! Eventually, the path splits in two and, at this point, be sure to take the right hand fork which drops down into the upper reaches of the Hen Hole. Cross the College Burn just above a surprise waterfall (NT 894197) and, once on the other side, turn right to follow the thin hillside contouring path for a short distance. Leave this path by ascending a rather bare and crumbling stretch of hillside which very quickly leads you, over a peat `step`, onto flatter ground. The border fence and the duckboards of the Pennine Way now lie little more than 50 metres ahead and are clearly visible. On reaching the `security` of the duckboards (NT 893196), turn right and a short walk will deliver you to the stone men perched along the rocky edge of Auchope Cairn and to yet another outstanding panorama. As you look towards the College Valley and to the seemingly endless hills beyond, the post and wire fence to your left is the flimsy international border between England and Scotland. In his 1976 book, `Walking the Scottish Border`, writer and broadcaster Bob Langley recounted how the first attempt to build a refuge hut on the Border ridge had met with disaster. 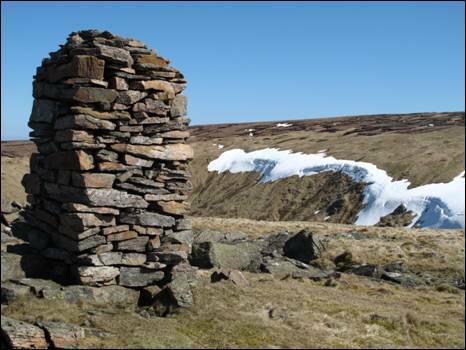 The hut was constructed by the 1st Battalion of the Black Watch in 1968, just below the fence to the west of the summit of Auchope Cairn, and Bob recalled, “looking for it one windy weekend and finding that the building had been literally blown to bits”. He found the building, “strewn all over the place - a door here, a wall there - and like Humpty - Dumpty, not all the king`s men could have put it together again”. 5. As you turn your back on this exceptional view and continue your journey south eastwards along the duckboards of the well trodden Pennine Way, the border fence will be your guide for the short distance to the next signpost. Here, at a meeting of fences (NT 896193), you must turn left to make your way to the highest point of the walk. Early Pennine Way guidebooks were less than complimentary about this out and back deviation from the main Edale to Kirk Yetholm route, a necessary evil it would seem, only for the purists. 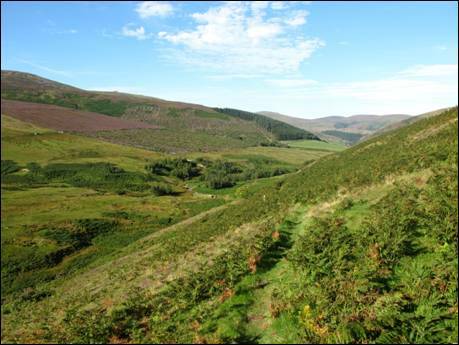 In his 1967 guide, Christopher John Wright wrote, “….the plateau is covered by an extensive waste of peat hags and bogs….”, whilst Tom Stephenson, a self-confessed fan of the Cheviot Hills, writing in 1969 said, “…..Cheviot is a wide featureless plateau with some peat groughs”. Some 16 years later, none other than A. Wainwright added his weight to the `Is it really worth the effort` argument when he wrote, “…..the Cheviot seen across an uninviting morass of peat and bog”, adding for good measure, “…..supermen may take it in their stride, but lesser mortals are better advised to leave it alone”. No problem these days, the once treacherous route is now mainly paved with stone slabs recovered from derelict cotton mills. Route finding is without problem as you first pass, on your right hand side, Cairn Hill and then a small lough, a permanent feature even in the driest of summers, before eventually arriving at the huge triangulation topped summit. 6. 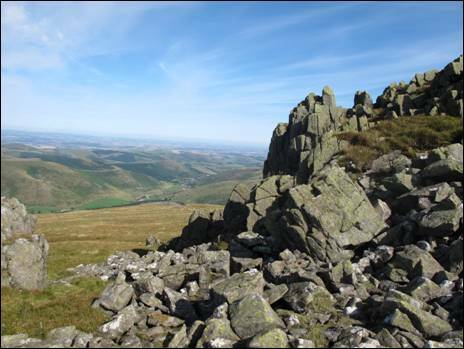 Standing at a height of 815 metres, the Cheviot is known affectionately as `Muckle Cheviot`, meaning `large or great`. Whilst the views from the actual top are not extensive, they are better seen along the way, a certain Daniel Defoe, when describing his visit here in 1726, seemed, after a decidedly uncertain start to the day, more than satisfied with the end result. He wrote, “The day happened to be very clear, and to our great satisfaction very calm, otherwise the height we were upon would not be without its dangers. We saw plainly here the smoke of the salt-pans at Shields, at the mouth of the Tyne, seven miles below Newcastle, and which was south about forty miles”. How the world has changed! Continue across the summit plateau and when you reach the ladder stile, cross over and start your descent, with the fence to your left, towards Scald Hill. Heading quickly downwards, the temptation is to break into a run, you will enjoy fine views to the Harthope Valley and beyond to the Northumberland coast. Immediately after a short, often boggy, col a quick and easy climb dumps you on the top of the 549 metre high Scald Hill. Continue downhill and when, after a short while, the fence turns to the north (NT 933221), you must bear to your right along a clear, rutted path heading in a generally easterly direction. To your right lies the second and third highest of the Cheviot Hills, the majestic Hedgehope Hill and the not quite so impressive Comb Fell. Now it is just a simple matter of enjoying the rest of the easy descent, with continuing views of the Harthope Valley laid out below you. After crossing the trickle of the New Burn you will immediately arrive at the tarmac valley road so be sure to turn left for the final few hundred metres meander back to the Hawsen Burn and your own personal `finishing line`. Mixed fell with steep ascents & descents, some good paths, a gravel track, two stretches of tarmac & sections of pathless terrain.